A channel for corporate communication to employees that only has up to date information, and uses email apps (mobile and desktop) to communicate that. More high tech, and less obtrusive than “Amber Alerts”. There’s also non-corporate usage too, but Enterprise usage is what you’d sell I think (Atlassian-style). I very much liked the idea of GoogleWave by the way. 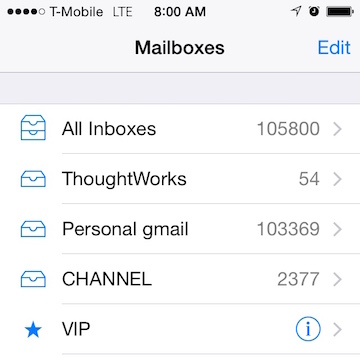 This is a microcosm of that (just the “pervasive inbox” aspect) and reusing standard technologies. ThoughtWorks got our own Wave capability while it was in alpha status, and it was fun to play with it while it lasted. You would have a additional IMAP account for mobile device users (primarily) and desktop users (secondarily) that has emails that are updated/deleted in-situ in the inbox. That would happen regardless of whether they’ve been read or not. Actionable emails, with HTML payloads is one category, but informational ones too. The account doesn’t have outgoing or incoming email capability as such - it is invisible to the outside world. This is a programmable IMAP system, where authorized interoperating systems post updates, remove emails etc. First Round - corporate licensees - install inside the firewall. Second Round - Personal & cloudy, with readily available integrations. The item gets updated frequently of course, and is mostly informational. It could have a mute capability, like GroupMe and Gmail do. Hedwig Email looks like a pretty good starting point. If it does not have all the plugin points needed, you’d create some more. You’d definitely need a bunch of new scripty / restful / web-interface things for interop, a dashboard, and control. You’d also need a trust/sandbox model for things doing interop with the inbox over those new APIs (instead of an improved SMTP - see below). At some level it feels like we’d need to keep and make available a history of what happened. Not only for regulatory reasons, but for the end user to be able to navigate too. Gmail’s roll-up of messages in the same thread is very useful, and it tries to pick the most pertinent info for the short rendition of the email in the inbox. Something deeper than that, perhaps. You’d ordinarily see the most recent version, but be able to click to see prior versions. Maybe to some level SMTP needs to be improved, and force changes on clients such that some things even become ordinary for fire and forget email. “Your flight is going to be late” emails could be replaced by “your flight has been cancelled” ones. That’s not just matching on subject line, it is correlated to a senders message ID, and replacing in the inbox rather than supplementing or correlating, as happens now. As I hint, I’ve tested the rewriting of email, and observed how it displays in iOS and Gmail, but we might find that delete & and rewrite is the better way forward. Slack (IM tool de jour) could benefit. Zendesk - a trouble ticket system we use. I guess there are hundreds of other pre-existing tools that could benefit. That someone else picked up the ticket can be useful if emails were superseded. I’ve not played with it myself, but I will do at some point I guess. I’ve read the reviews and it sounds like it is only a start right now. Hence my posting, while I’m still talking about things that have not been done yet.